Legendary voice actor Billy West is taking his spoof of a character, Zapp Brannigan, and putting him to good use. With over 200 acting roles under his belt, voice acting and otherwise, West's substantial repertoire of voices and a heck of a lot of experience have enabled him to spread a message. Just what is that message, you ask? 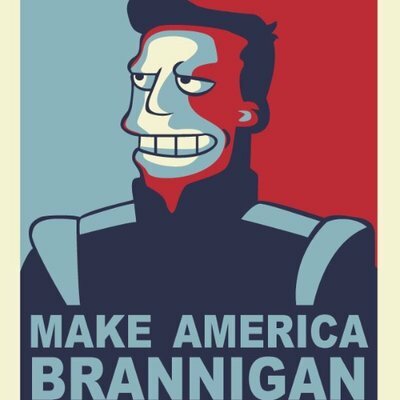 Take a look at West's Twitter account where he's shared 33 Donald Trump quotes recorded in his signature Brannigan voice. He's even dragged Kif Kroker, Brannigan's right hand man, into the mix by adding Kif's trademark sigh of dismay to some videos. Clearly, West has something to say about the 2016 presidential election. You have to admit, the likeness between Brannigan and Trump can hardly be understated. West has managed to throw even more doubt on Trump's character by highlighting the similarities in both characters (I use the term character purposefully).Going through each of the quotes, the parallels become more and more pronounced: the way of thinking, misogynistic attitude, egotistical nature. All of the quotes can be found on West's Twitter using #MakeAmericaBrannigan. Thoughtful as ever, West has included a source for each quote. I've cherry-picked a few of my favourites. For those of you unaware, Brannigan is modeled after the original Star Trek captain, James T. Kirk of the USS Enterprise, whose sole mission is to explore space: the final frontier. William Shatner played the captain, doing a fine job of attempting to kiss every alien woman he encountered and acting in a way that's never since been reproducible (and for good reason). The running joke with Futurama producers is the Brannigan persona, a mix between the Captain Kirk character and William Shatner the person.